This entry was posted in ARC Past Events Past Events and tagged social change on August 13, 2014 by arc_berkeley. In October of 2012 and 2013, the Arts Research Center and the Curatorial Practice Program at the California College of the Arts partnered with Creative Time to host a live-streaming of their annual Creative Time Summit. The live-streaming event provided a collective viewing experience for Bay Area artists, curators, scholars, and activists who are concerned with arts and social change. In addition to seeing the talks and panels from New York, participants had access to local responses and face-to-face small-group discussions. In 2012, the focus was on confronting inequity across the globe and the ways in which wealth disparities erode democracy. 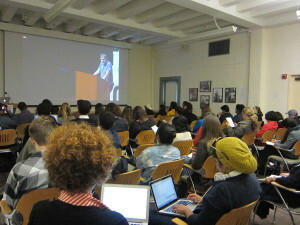 Keynote speakers at the Summit included cultural critic Slavoj Žižek and multimedia artist Martha Rosler. The 2013 theme of the conference, Art, Place & Dislocation in the 21st Century City, intersected with key tenets of this research area, notably how the work of “socially engaged” cultural producers (artists, critics, writers, and curators) responds to urban and rural plan. In 2013 Professors Shannon Jackson, Margaret Crawford, Lauren Kroiz and our invited attendees were in conversation with Creative Time presenters, Pablo Helguera, Rick Lowe, and Gregory Sholette.